And while nobody likes to think about emergencies, a small amount of preparation can mean the difference between safety and disaster. 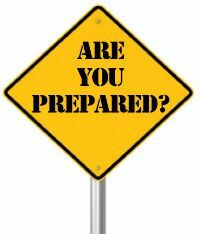 Click here for more information about how to prepare your home and family to stay safe in difficult times. Home Remodeling: Are You Ready For Some Football (or the New Fall Shows)? September also is a great time to prepare your home for some serious fall television viewing. Whether you’re anticipating watching the World Series, the kick-off of the NFL or college football seasons, or the newest batch of fall shows, you’ll want to do it in comfort and style. Ah, but where will you watch? More and more families want to enjoy the pleasures of big screen entertainment - without having to sacrifice the comfort and style of their family rooms to do so. That probably means creating a great family entertainment room. But there’s more to doing that than just buying a big screen T.V. and hauling it down to the basement or into the spare bedroom. If you decide to use an existing room for this important space, you’ll want to make sure that space is really ready to be turned into a comfortable place where people enjoy being. That means proper lighting, wiring, flooring, and perhaps even plumbing. Can you reinvent the room by putting built-in shelving between the studs? By doing that, you can dramatically increase your storage space without losing any of the room’s square footage. And if you’re planning an entertainment room, don’t limit yourself to TV viewing. Think about other activities such as gaming, crafts, karaoke, or whatever you enjoy. And talk with us about creating the best plan to get the most out of your family entertainment center. The better your plan, the better the result. Don’t settle for “just a place to watch the game.” Make sure your family entertainment room is a place you, your family, and your friends love to hang out! How Big Is Big Enough? Choosing the Right Size Screen For Your Entertainment Room. No matter where you build your new entertainment room - or whatever else you use it for - being able to watch movies, sports, or your favorite shows will still be a big part of the room’s use. So what size screen should you put in your new room? While some say, “Bigger is better,” that only goes so far. Your budget, of course, is an important factor. But size and distance both matter. In most homes people sit about 9 feet away from the screen. For that distance, THX (The Home Entertainment experts) recommend anything from a 60” to a 90” screen. If your room is a little smaller, and you’re sitting about 4-6 feet away a 40” screen should be big enough. Click here to check out their other recommendations - including screen height.